Many scientific phenomena, perhaps a majority of them, ultimately obey or follow fairly simple laws of nature, once discovered and understood. The scientific concepts we understand the least are often cloaked in the most complex of language and theories. When any scientist cannot clearly explain his or her research to a layperson unschooled in that area, there usually exists a corresponding lack of complete understanding by that scientist. One can research the outer layer of an onion indefinitely without having any understanding of what is going on several layers deeper. Yet the onion as a whole can remain a mystery even though mountains of research data might have been generated on the outer layer. While researching thousands of articles over the last few years in the preparation of my latest book on vitamin C (Levy, 2002), interesting patterns began to emerge. Even though the effects of vitamin C on over 25 different infectious diseases and over 100 different toxins were examined, common mechanisms of action became apparent. 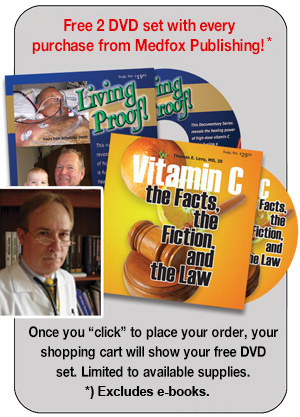 This was especially significant to me since I had long wondered how a single chemical entity (ascorbate, or vitamin C) could have such dramatically positive clinical effects on such a wide array of completely unrelated chemical compounds and infectious agents. Quite literally, there seemed to be no exceptions to this vitamin C effect. Even if vitamin C did not cure a given infection or toxic state, it always helped resolve such a condition to some degree. Dr. Albert Szent-Gyorgyi, the brilliant scientist who won the Nobel Prize in 1937 for his discovery of vitamin C, also advanced what I would call a true theory of life in two of his last publications. Szent-Gyorgyi (1978, 1980) asserted that energy exchange in the body can only occur when there is an imbalance of electrons among different molecules, assuring that electron flow must take place. Natural electron donators give up electrons to natural electron acceptors. Szent-Gyorgyi maintained that dead tissue had a full complement of electrons, a state in which no further exchange or flow of electrons could take place. Another way of viewing this is that brisk electron flow and interchange equals health, impaired or poor electron flow and interchange equals disease, and cessation of flow and interchange equals death. Vitamin C, as the premier antioxidant in the body, is perhaps the most important ongoing electron donor to keep this electron flow at optimal levels. Oxidation involves the loss of electrons, and an antioxidant counters this process by supplying electrons. Although vitamin C is the most important antioxidant in the body, there are many different antioxidants present in the body, and many of them work to keep the more important antioxidant substances in the body in the reduced state, which allows the donation of electrons. For example, vitamin E is an antioxidant that is fat soluble, which is important in allowing it to be the primary antioxidant present in the lipid-rich cell membranes of the body. Vitamin C, which is water soluble, helps to recharge oxidized vitamin E in those cell membranes back to the electron-rich reduced form. Even though vitamin C is not the primary antioxidant in the cell wall, it plays a vital role in maintaining the optimal levels of the metabolically active antioxidant, vitamin E, at that site. It appears, then, that the local loss of electrons (oxidation) represents the primary degeneration, or metabolic breakdown, of the tissue or chemical substance losing the electrons. An antioxidant can serve to immediately restore this loss of electrons, resulting in a prompt "repair" of that acutely oxidized tissue. Also, an antioxidant can often neutralize the oxidizing agent before it gets a chance to oxidize, or damage, the tissue initially. All toxins poison by oxidizing enzymes and tissues. All toxic damage can be repaired by a high enough dose of antioxidants. Of course, such therapy must be given in a timely fashion, before irreversible clinical consequences have occurred in the poisoned subject. Interestingly, infectious diseases inflict their damage in essentially the same way as toxins. As virulent microbes grow inside a host, one or more of the same six findings as already listed above will reliably be observed. Basically, microbial growth is just another way to directly cause oxidative damage to the tissues most directly involved. Some of the most devastating infectious diseases also produce potent toxins that further increase the oxidative damage and stress to the infected host. Chronic disease can be viewed as a process in which the oxidative stress proceeds at a much slower pace than is seen with acute infectious diseases and acute toxin exposures. Vigorous antioxidant therapy goes a long way in reversing the clinical manifestations of such diseases as well, as long as the dose administered supplies enough electrons on a daily basis to reverse the ongoing oxidative damage from the disease process. Unipolar magnetic therapies probably affect electron delivery to an injured site as well. Electricity is considered the flow of electrons. Putting a magnetic field in motion will induce electricity. Electron flow would appear to be intimately involved in the physical and biological effects of magnetism. The work of Davis and Rawls (1975, 1979) established nicely that a North pole magnetic exposure decreased inflammation and pain, while suppressing microbial growth. The South pole had the opposite biological effects. One possible explanation for these findings is that a North pole magnetic field facilitates the delivery of electrons into exposed tissue, while the South pole facilitates the transport of electrons away from exposed tissue. Regardless, the proper use of the North pole of a strong biomagnet closely mimics the effects of vitamin C delivered systemically. Kulish (1999) summarizes the effects of such biomagnetic therapies nicely. Is compromised electron flow the final common denominator in producing the symptoms and effects of most (or all) diseases, infections, and toxin exposures? Regardless of the answer, the vigorous and persistent dosing of antioxidant therapy, as discussed and researched in my new vitamin C book, appears to deliver consistently positive and dramatic clinical outcomes. Davis, A. and W. Rawls. (1975) The Magnetic Effect. Kansas City, MO: Acres U.S.A.
Davis, A. and W. Rawls. (1979) The Magnetic Blueprint of Life. Kansas City, MO: Acres U.S.A.
Kulish, P. (1999) Conquering Pain. The Art of Healing with Biomagnetism. Fountainville, PA: Fountainville Press. Levy, T. (2002) Vitamin C, Infectious Diseases, and Toxins: Curing the Incurable. Philadelphia, PA: Xlibris Corporation. Szent-Gyorgyi, A. (1978) How new understandings about the biological function of ascorbic acid may profoundly affect our lives. Executive Health 14(8):1-4. Szent-Gyorgyi, A. (1980) The living state and cancer. Physiological Chemistry and Physics 12(2):99-110.